The Karesansui, or Rock Garden. 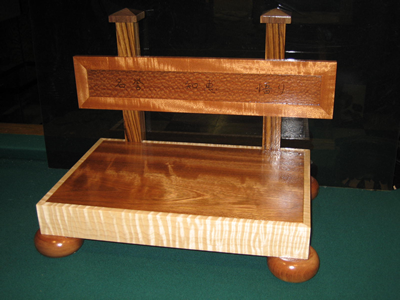 This piece was made of Honduran Mahogany, Padauk and Curly Maple. 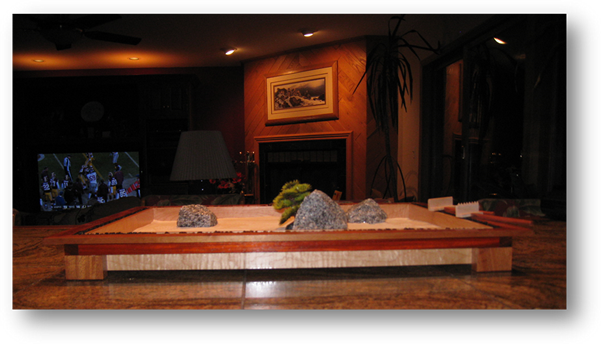 The black you see in between the maple interior and mahogany boarder is gravel, commonly seen in fish tanks. It was epoxied in place. 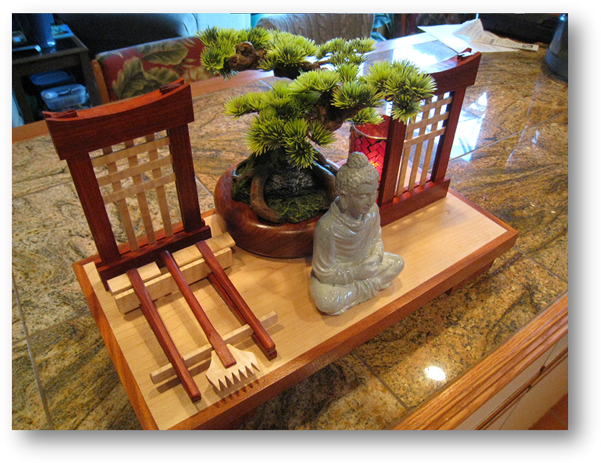 As a compliment to the Karesansui, I made a platform for the tools and placed Siddartha, who went on to become "The Buddha", to sit and watch over the Karesansui. 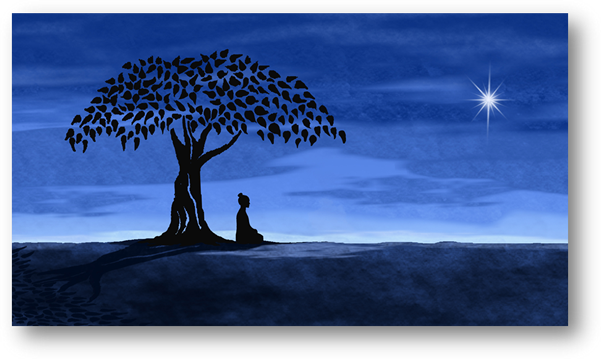 It is said Siddartha sat under a fig tree contemplating why there is so much pain and suffering in life. He came from wealth and, until he walked away from that life, never knew suffering. I couldn't find a fig tree to scale but I did find a Bonsai tree. That is a no-no in Buddhist beliefs. I found that out the hard way! A man once came to see the Buddha to get help with his problems. After the man had told the Buddha one of his problems and asked for help, the Buddha replied: "I cannot help you get rid of that problem." The man was surprised that the Buddha could not help him in this regard, but he told the Buddha about another problem; he thought to himself that the Buddha should at least be able to help him with that problem. But the Buddha told him "I cannot help you with that problem either." The man started to get impatient. He said: "How can it be that you are the perfectly Enlightened Buddha, when you can’t even help people get rid of their problems?" The Buddha answered: "You will always have 83 problems in your life. Sometimes a problem will go, but then another problem will come. I cannot help you with that." The baffled man asked the Buddha: "But, what can you help me with, then?" The Buddha replied: "I can help you get rid of your 84th problem." The man asked: "But what is my 84th problem?" The Buddha replied: "That you want to get rid of your 83 problems." This piece was made from 7 different woods - Honduras Mahogany, Teak, Spanish Cedar, Walnut, Curly Maple, Zebrawood, and Leopardwood. No coloration was used. It was finished with lacquer. The bun feet are Honduras mahogany, turned on a lathe. 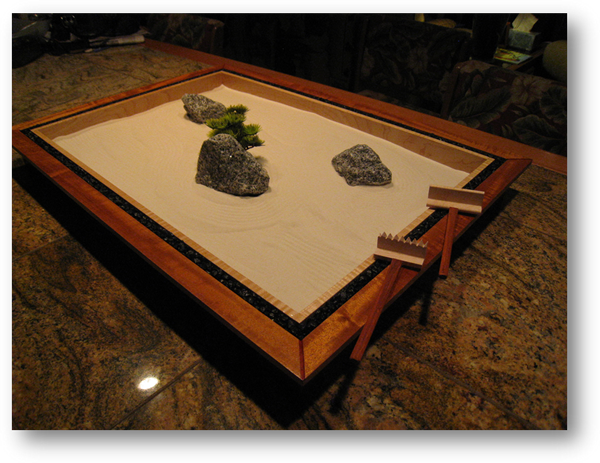 The boarder is curly maple, the platform teak. The posts are zebrawood and the caps are walnut, carefully cut on the table saw. The "banner" is leopardwood with a Spanish cedar boarder. The Japanese symbols, burned int the banner, speak of love, friendship, family and happiness.